Today we will teach you how to create your own Line Item Numbers in Salesforce. We recently had a need to add Line Item Numbers to the Salesforce Campaign Members related to a Campaign. 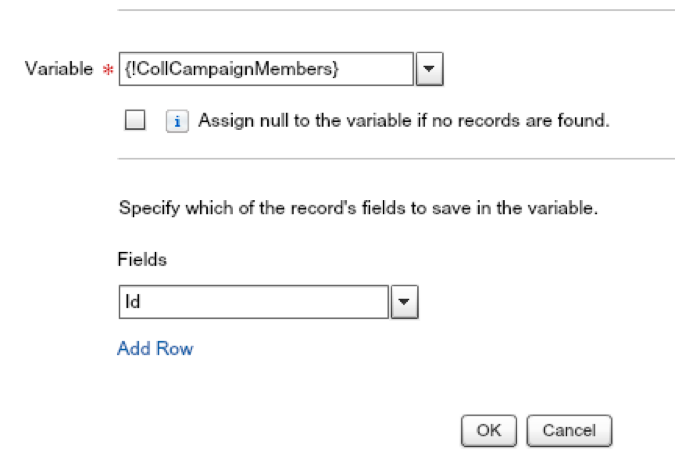 At first thought, one would think to use an “Auto Number” field on the Campaign Member object but this field assigns numbers sequentially across all records in an object, so the numbers for each record would just keep increasing across all Campaign Members. What we actually want is for the numbers to start over for each Campaign, so as Campaign Members are added, the numbers increase for that Campaign. Then, to add more complexity, we needed the numbers to recalculate as records are added or removed, so we do not have gaps in the sequence. After doing a bunch of research, it seemed the only option was to use Apex code, since the records needed to be updated each time a record is added or removed from the list. As it turns out, this functionality is quite easy to create using standard Salesforce automation, including Process Builder and Visual Flows, with a little help from a Roll-Up Summary field. We built this on the Campaign/Campaign Member relationship but it can also be used for Quotes and Quote Line Items, Accounts and Opportunities, or anywhere else where a Roll-Up Summary field is available. For other relationships, like Accounts and Contacts, the free DLRS application will give you the ability to count all related records (and more) from the parent record. The first thing you need to do is create a couple of fields. 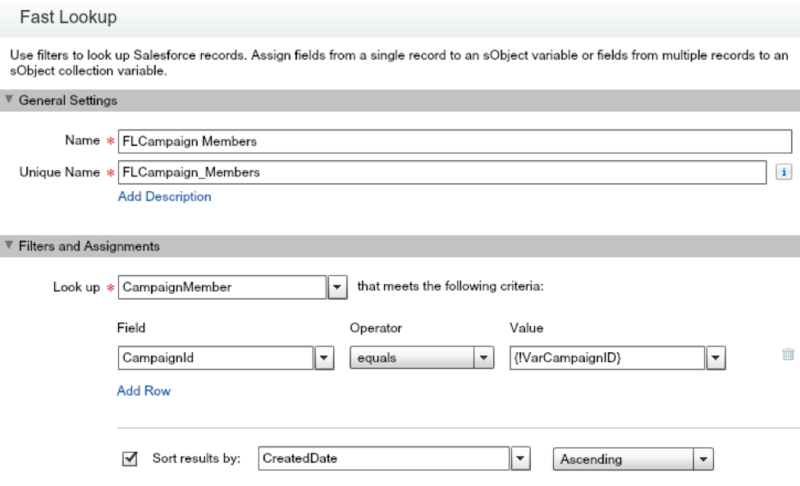 On the Campaign object, create a Roll-Up Summary field called “Total Members” that counts all related Campaign Members. This field gets updated each time a Campaign member record is added or removed, which allows us to fire a Process Builder process off of it. 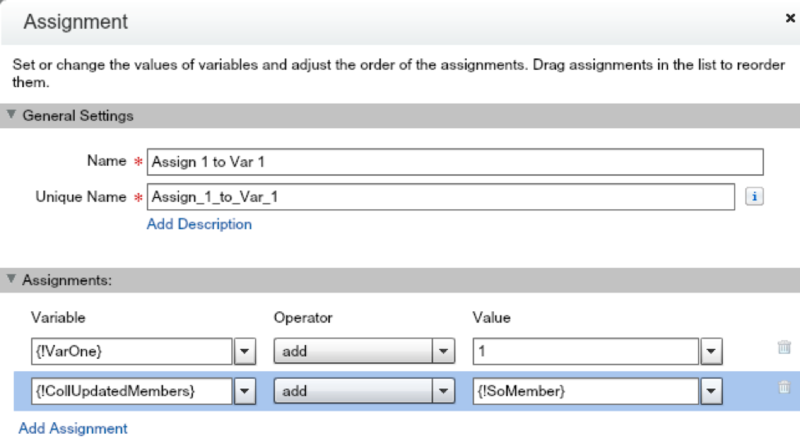 Then, on the Campaign Member object, create a new “Member Line Item Number” number field with zero decimal places. You may want to make this field read only or remove it from page layouts so it cannot be edited by a user. Now for the fun part; creating the Visual Flow. 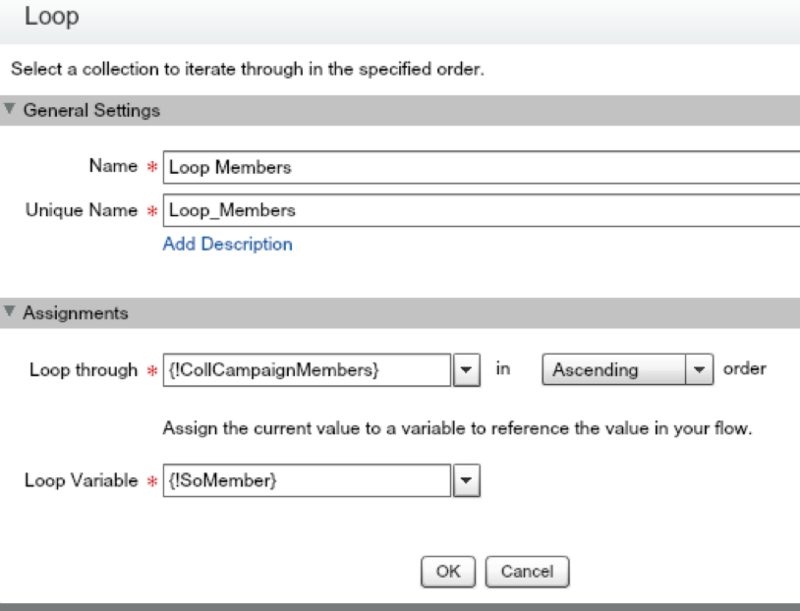 Each time a Campaign Member is added to a Campaign, we need to look at all associated members and assign sequential numbers, based on the order that they were added. Below is a picture of the Flow as a whole. This needs to be saved as an Auto-Launched Flow to work properly. Now that the resources are created, the steps can be created. The first item is the Fast Lookup. This will be the start of the Flow. 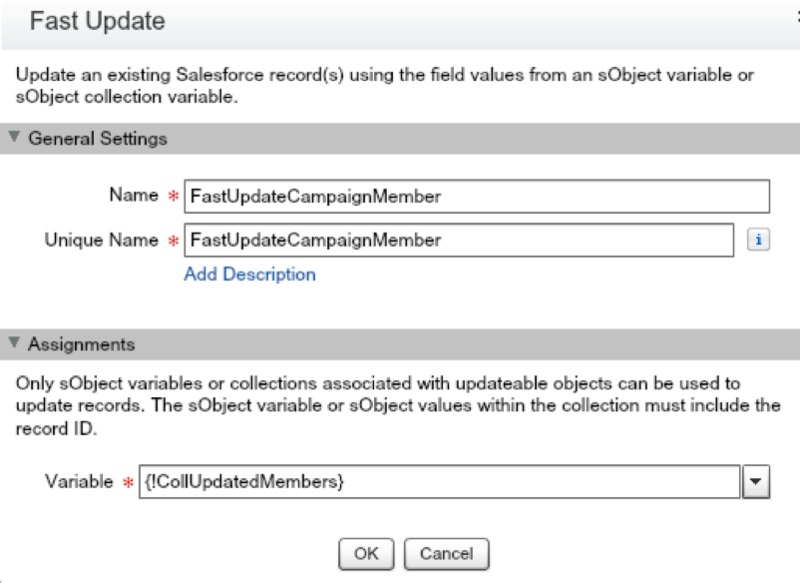 It needs to look up to the Campaign Member where the Salesforce Campaign ID equals the value in the “VarCampaignID” variable. We want the Line Item number applied by when the member was added so this step is sorting by the Created Date in Ascending order. This could have been done in one assignment but having two allows better clarity on the actions. 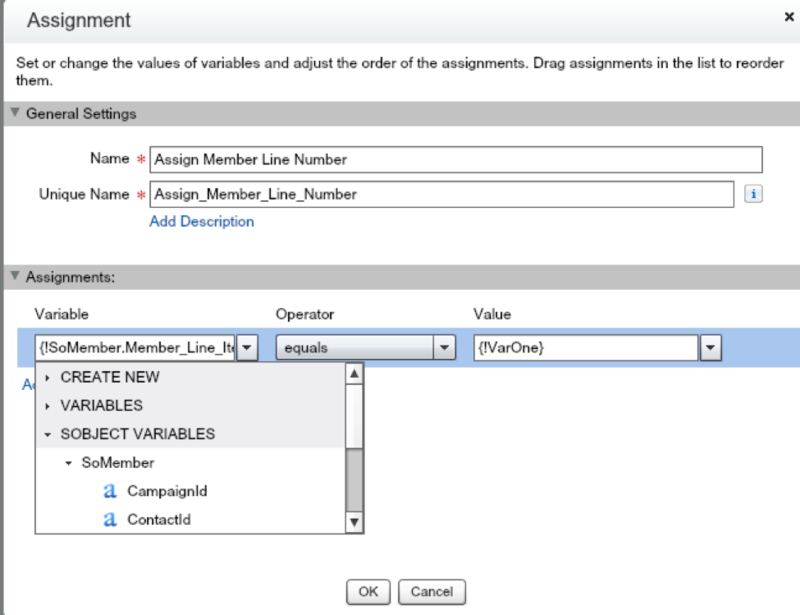 The first step set the first Campaign Member’s line item number to “1”, the default in the VarOne variable. This step adds 1 to the VarOne variable and assigns the updated record from the first assignment to the collection of records to be mass updated. Then, the Flow goes back to the Loop for the second record, adding “2” to the line item number field. The process repeats until all records have been updated. See the screen shot below. Now, we just need a Process Builder Process to fire the Visual Flow. 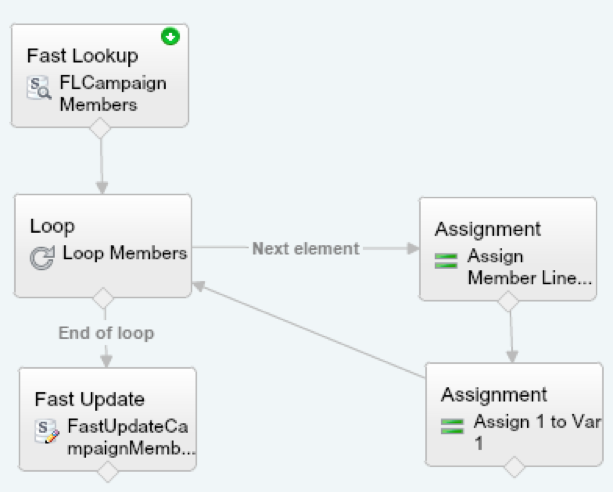 I created a Process on the Campaign object with a Criteria Node that checks to see if the Campaign “Total Members” Roll-Up Summary field has changed AND the field is greater than zero.